Although we had not planned to even stop in Bodega Bay, the storm along the coast convinced us to spend four days in this lovely marina. 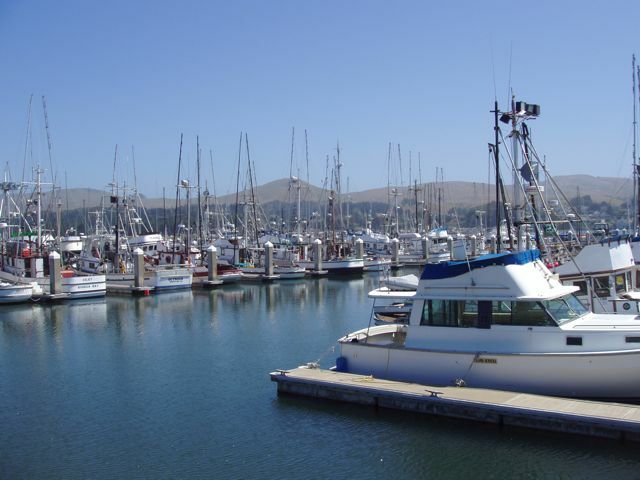 It's an attractive, reasonably-priced marina in a beautiful location. We were even given ten large crabs on our first day there. Conni's father very kindly drove to fetch us and return us to the boat when the July 4 celebrations and offshore storm were done. Next stop, San Francisco! Boat ownership in a nutshell! 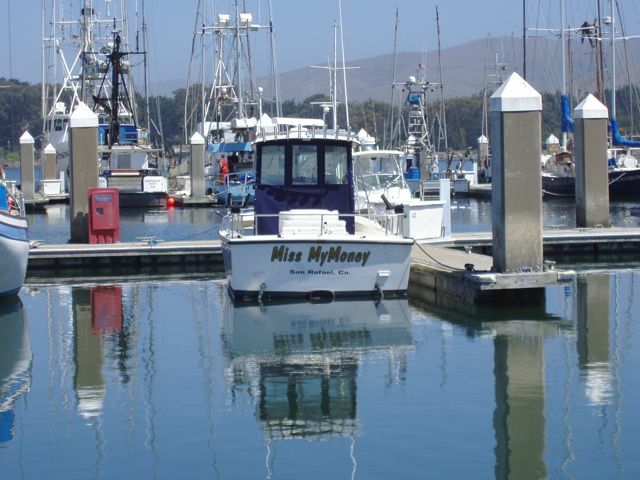 I've never seen this funny boat name before, but it shows great cleverness, and a bit of cynicism, on the part of the owner. Wings after a few hours of scrubbing. She hadn't been washed, other than rain, since last year. I still think that she's the prettiest sailboat that I ever saw. 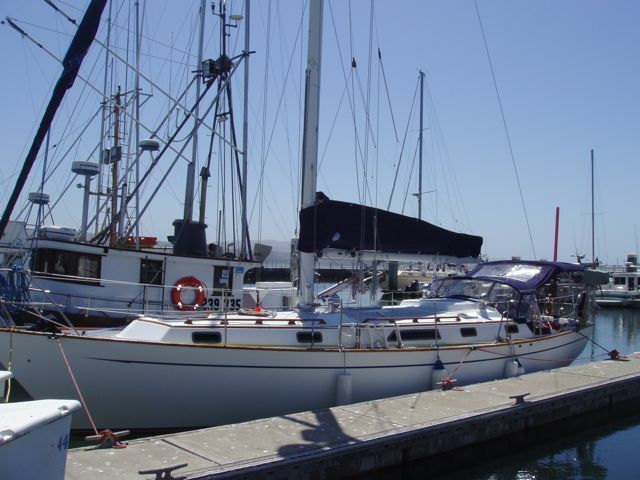 A "salty" cruiser, a Westsail 34. 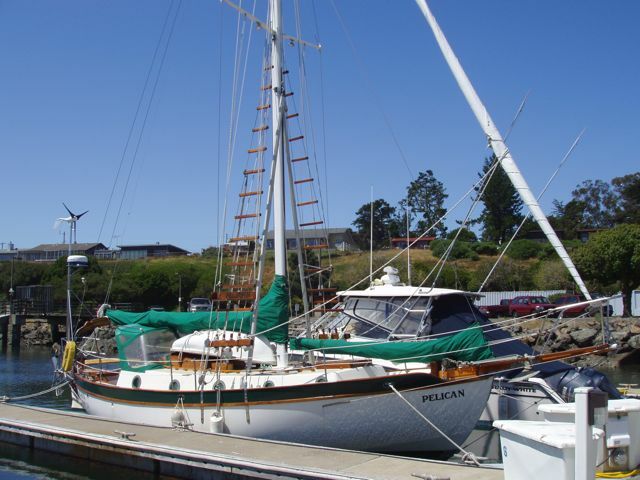 She shows a nice combination of very traditional nautical features: rat lines for climbing up the mast, belaying pins on the shrouds, lovely wooden bowsprit, and exterior chain plates (tie-down points for the mast-supporting shrouds), as well as a modern wind generator and radar. This classic double-ender can go anywhere. 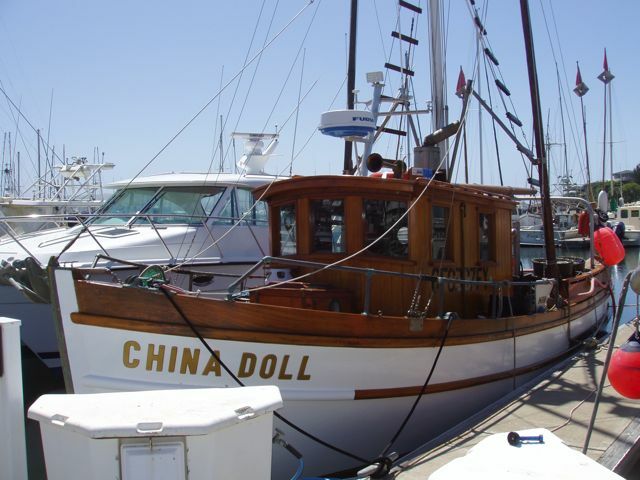 The best maintained wooden fishing boat that we've ever seen. Her topsides and deck are varnished and I can tell you that it's a lot of work to keep her looking this nice. She's a salmon troller. A few of the salmon trollers along C float. Many are wooden and in excellent condition. The typical "Golden Hills" of California are across the small lagoon. 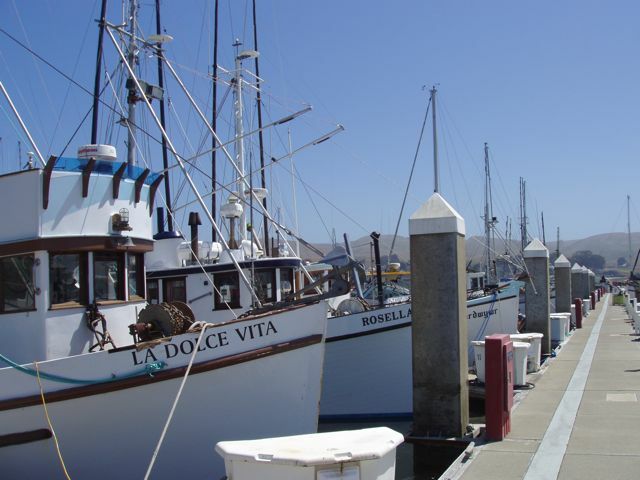 The Spud Point Marina hosts a lot of local crab boats and salmon trollers, as well as more transient cruisers. Each salmon troller has two very long "fishing poles", one on each side, from each of which, 3-6 braided-steel fishing lines are towed. The catch is sold as "troll-caught" or "line-caught" salmon and is of the highest quality, never having been mashed in a net. They command the highest price for the fishers. If you buy salmon in a restaurant or store, it's either farmed or troll-caught. Friends don't let friends eat farmed salmon!